Millet is one of those grains that I think are under-appreciated. Okay, that and it’s also birdseed. Don’t let that stop you from trying it — why should those birds have all the fun?! It’s pretty plain on its own though, so I like to add different things to spice it up. Apparently, millet (or prosa) is fairly common in Latvia. My husband was certainly happy to see it in the bulk section at Winco; I think he missed having it! It’s pretty easy to cook – quite similar to rice, really. It’s a 2:1 ratio of liquid to millet and steamed to fluffiness. In a dry cast iron skillet over medium heat, toast millet until it browns nicely. Combine all in a rice cooker and press Cook. In a dry cast iron skillet over medium heat, toast millet until it browns nicely. Combine millet and water in a rice cooker and press Cook. Fluff with a fork when cooked and stir in cream and maple syrup to taste. This entry was posted in breakfast, dairy-free, gluten-free, recipes, side, untranslated, vegetarian. Bookmark the permalink. Millet is one of those grains I can never recognize. I buy it, pop it in the pantry then have no idea what I’m cooking. 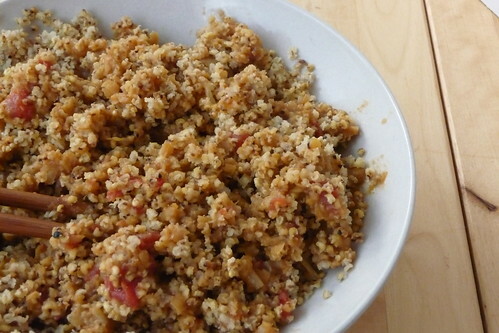 I love the Maple millet recipe though looks very tasty. I think cream is essential despite the calories, it’s just not the same with milk (at least skim).